Thank you for your service, Chief. My sincere condolences to your family and your Department. Your name and memory are Sacred and Revered. Rest in peace Brother. 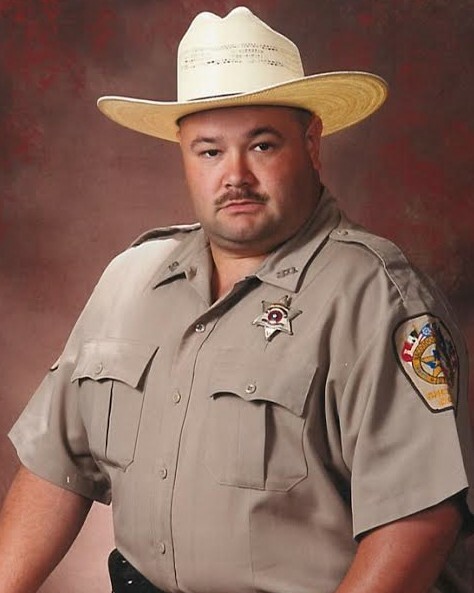 Rest in peace, Deputy Jimmerson. You deserve your divine reward. My deepest condolences to the family of Deputy Jimmerson. Good Speed and Rest Easy my brother we got this from here. Current Angelina County resident. On behalf of the Klamath County Sheriff's Office in Klamath Falls Oregon, we send our sincerest sympathy in the recent loss of your Deputy, Raymond Bradley Jimmerson, in the line of duty. It is always a huge loss when a fellow deputy makes the ultimate sacrifice. His bravery and courage to protect and serve your community has not gone unnoticed. Thank you for your service and sacrifice. Rest In Peace Sheriff Jimmerson. Our deepest heartfelt condolences to all of your family, friends, and brothers and sisters at Nacogdoches County Sheriff's Office. Sheriff Bridges, my prayers and condolences to your Department on the lost of such a fine Officer. His family and your department will be in my prayers. Jimmerson family and friends may God grant you all with a speedy healing. Deputy Jimmerson thank you for your Service to your Community and to your Department. Most of all thank you for your Ultimate Sacrifice in the Line of Duty. RIP Deputy Raymond Jimmerson, and may your soul forever rest in peace. I lived in Nacogdoches for 8 years until moving to Dallas 25 years ago. A good friend was a police officer at SFA and Nacogdoches PD. I was a probation officer in Angelina Co for 13 months before continuing my career in Dallas. I worked with law enforcement both in Nacogdoches and Angelina Counties. My deepest sympathies for this tragic loss. I didn't have the privilege of meeting Deputy Jimmerson. That is my loss. My prayers and thoughts to his family. His sacrifice will always be appreciated not just for that day but his career and dedication. take care. My thoughts and prayers go out to the family and friends of Deputy Sheriff Raymond Jimmerson who was tragically killed while performing his duty. Rest in peace. Rest in peace Deputy Jimmerson, my sincere condolences to your family and to your department. God speed as you now patrol the streets of gold. Your ultimate sacrifice will not be forgotten. On my behalf and that if the Utica, Indiana Police Department, our thoughts and prayers to your family and Department. Rest in Peace Officer Jimmerson! Thank you for your service and sacrifice. Prayers for your family and friends. Our condolences go out to the family, friends, and coworkers. Rest In Peace my Brother in BLUE. What a terrible loss! My heart goes out to his fiancée and family. I’m sorry to see this fine servant go so soon. God bless his soul! Jeremiah 29:11-15 helped me know I still had a future and hope when my husband died too young. My prayers are with you all.